Nostalgia and consumerism rub elbows at the Indiana State Fair: a man crafting a spindle-backed rocking chair and a woman tufting brooms can be found mere steps from a peach shakeup station. You can purchase a walleye sandwich right outside the Department of Natural Resources’ fish tanks displaying all the state’s wild species. And stand in line for a ribeye sandwich adjacent to the cattle barn or chomp down a pork chop near the pig barn, where the state’s largest hog—typically topping 1200 pounds—lies lethargic in his pen. Nature and artifice commingle: the buttery, foil-wrapped ear of corn and the doughy invention of deep-fried Pepsi. This mélange of home ec, 4-H, carnival rides, and fried everything has found its troubadour in Terry Kirts. His “State Fair Suite” is equal parts participation and observation. Kirts hails from the small town of Ste. Marie, Illinois and later moved to the Hoosier state to get an MFA in poetry-writing from IU. For years, he has written restaurant reviews for publications such as NUVO and Indianapolis Monthly. Kirts knows his way around a Fry Daddy, and every year, he awaits the puffy corn dogs adorned with mustard. But he’s also alert to the fair’s many ironies, its garish, Camp appeal, the quasi-religious rituals of its annual pilgrims. In the lineage of Allen Ginsberg’s “America” and Frank O’Hara’s “Ave Maria,” this poem combines send-up and homage, “found” elements and invention. The first section, “Main Street Saints,” takes us behind the scenes of greasy food prep while also suggesting liturgical correspondences. We learn the “woman who ‘blooms’ onions does not cry / when the fumes fog the prep tent.” We see “blonde teenagers in soaked t-shirts scoop pork rinds / into gallon bags.” And on a banner above a Moon Pie fryer, Kirts glimpses this quotation from Colossians 1:13: “He has rescued us / from the dominion of darkness / and brought us into the kingdom.” Can I hear an amen? The poem returns to the litany form in its final section “This Corn Dog,” where the quintessential fair food appears both as itself and as the personified embodiment of Americana. This is the corn dog as pop culture icon, like Andy Warhol’s soup cans or Claes Oldenburg’s ice cream cone. Kirts is tuned in to all the dog’s resonances: war heroics and football, a whiff of xenophobia and a big helping of excess. So grab some extra napkins and that squirt bottle of mustard. Step right up for this one-of-a-kind litany. This corn dog does not occur in nature. This corn dog counts for two meats and one grain. 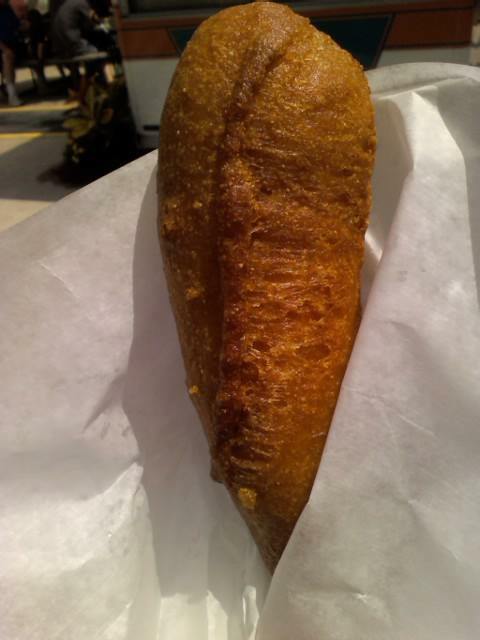 This corn dog is not a falafel or a veggie kabob. This corn dog was still crunchy after an hour in the rain. This corn dog is cornerback, center, and tight end. This corn dog leans right but votes independent. This corn dog lifts skirts, pats bottoms, and belches in church. This corn dog is “Old Hundredth” played on the loudest ranks. This corn dog absconds with the evidence. Those fingerprints are yours. This corn dog could be the last thing I ever eat.